Car subwoofers are manufactured with either a single voice coil (SVC) or dual voice coil (DVC). The difference is the DVC sub offers more wiring options to better match and take advantage of the amplifier. The DVC sub is can sometimes be slightly more expensive, but provides multiple impedance connections which may result in more power from the amplifier or to better match the available amp impedance options. The voice coil differences have no direct effect on the subwoofer performance, frequency response, or power rating. A dual voice coil sub does not directly perform better than the same sub with a single voice coil. A voice coil is the coil of wire around the former (tube) attached to the apex of the speaker cone. The voice coil provides the motive force to the cone by the reaction of a magnetic field to the current passing through it. A single voice coil has one winding coil and a dual voice coil has two separate windings. Since both coils are energized, they perform the same as one with no difference other than wiring connection options. Many car amplifiers, especially high powered models, are designed with unregulated power supplies. This technique increases the power available as the load impedance decreases, while still providing compatibility with higher impedance combinations. The standard impedance loads are 2 ohm and 4 ohm with some models offering 1 ohm and 8 ohm outputs. The amplifier load is the subwoofer or combinations of subwoofers on any one channel. Most car amplifiers provide specified amounts of power (wattage) at common impedance ratings measured in ohms. The MTX THUNDER1000.1 mono channel amplifier for subwoofers is rated at 350 Watts wired to 4 ohm impedance load (speaker combination), 600W RMS at 2 ohms impedance load, and 1000W RMS at a 1 ohm load. A 2 ohm, single voice coil sub has a fixed 2 ohm impedance rating, so would draw 600 watts from this amplifier. The same 2 ohm sub with a dual voice coil would offer 1 ohm and 4 ohm connections, depending on whether you wire the two voice coil terminal pairs in series or in parallel. Choosing the 1 ohm wiring method for this sub would make 1000 watts available from the same amplifier. When wiring multiple subwoofers to the same amplifier channel, the ohms seen at the amplifier depends on the series or parallel wiring combination of the subwoofers. Again, dual voice coils offer more multiple car subwoofer wiring options just as they provided more single wiring combinations available to match the amp requirements. You may want to bridge a two channel amplifier to provide greater power to a single channel output such as a subwoofer. (This effectively converts the two channel amp into a mono amp) Or you may want to feed multiple subwoofers each with separate channel from a mutli-channel amplifier. Dual voice coil subs ensure the flexibility to allow the best connection. For a two subwoofer example, wire both dual voice coils in series to present 8 ohms from each sub, then wire the two 8 ohm subs in parallel to bring the total impedance presented to the amplifier to 4 ohms, a common setup when bridging two channel amps. 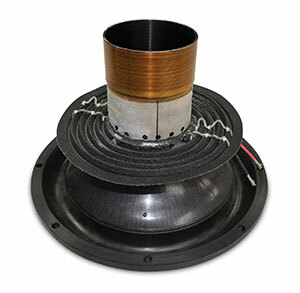 The flexibility of the dual voice coil car subwoofer wiring options increases the initial choice of matching amplifiers, typically maximizes the power available from that amplifier and provides more options when making changes and additions in later installations such as adding an amp or subwoofers.